The W.O.G.D. is proud to present our first “Knowledge Lecture” in a box: The Flashing Flashcards! This can be considered two separate decks. The “flashing” portion comes from the 25 tattwa cards. These elemental symbols come from the Samkyha school of Hindu philosophy. The word tattwa is Sanskrit in origin and means “principle,” “reality” or “truth.” In the original Hermetic Order of the Golden Dawn, meditation on the tattwas was kept from initiates of lower grades. Within the W.O.G.D., nothing is “above one’s grade,” and so we encourage Aspirants of all levels of experience to investigate what the tattwas can do for you. Five elemental principles are combined into 25 cards. The yellow square is called prithivi and it corresponds to the element of Earth. Vayu is a blue circle and it corresponds to the element of Air. Water is represented by the silver crescent known as apas. The one symbol common to both the tattwa system and traditional Western esoteric elemental symbols is the upward-pointing red triangle for the element of Fire, known as tejas. Lastly, the element of Spirit is symbolized by the dark indigo egg of akasha. An excellent article on the tattwas and their use can be found at the GoldenDawnPedia – Introduction to The Tattwas. 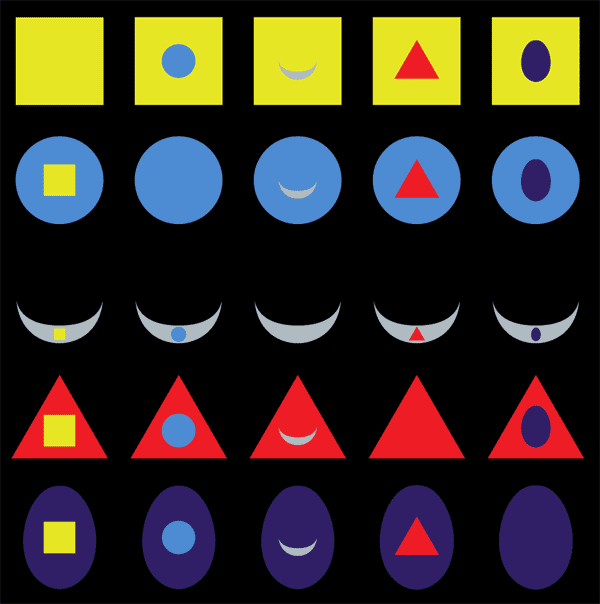 The other portion of the Flashing Flashcards package are a set of 22 Hebrew letter flashcards. 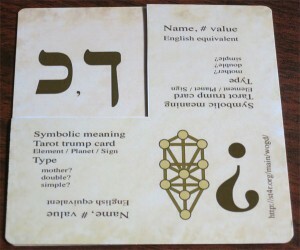 A special card in the deck is designed to have one quarter cut away, forming a mask which allows you to view one of the quadrants of the Hebrew letter cards at a time while providing generic reminders of what information is being covered. Here, the letter forms of Kaph and Kaph final are revealed by the masking card. Text prompts in the lower left are reminders that the hidden information includes the symbolic meaning of the letter form, the corresponding Tarot trump card and whether the letter is one of the three mother letters corresponding to an element, one of the seven double letters corresponding to a planet or one of the twelve simple letters corresponding to a Zodiac sign. The prompts in the upper right note that the information currently obscured include the name of the letter, its numeric value and the English equivalent letter sounds. The lower right corner has on it an unlabeled Tree of Life diagram, indicating that the hidden information here is to which path on the Tree, connecting which Sephiroth this letter is associated. 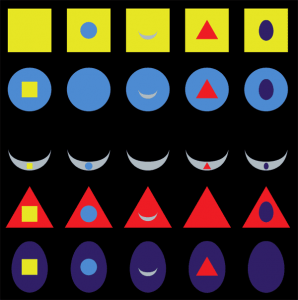 The “mnemonic mask” card is two-sided and it can be oriented such that each of the four quadrants of information on the flashcards are individually revealed while simultaneously covering the remaining three quadrants with the appropriate informational prompts. A text to accompany your study of the Hebrew alphabet and its correspondences with the Tree of Life, we highly recommend Lon Milo duQuette’s Chicken Qabalah. The Flashing Flashcards are available from thegamecrafter.com with more “action shots” of the deck available on the store page.